It’s speedy. It’s lavish. It’s international. It’s the Formula 1. With 20 determined drivers racing across 21 nations worldwide, car enthusiasts and globetrotters alike are traveling across borders to experience the competition first-hand. The ultimate cross-border event highlighting different nationalities and host countries begun its journey on March 25 in Australia and moved across the globe to the Canadian Grand Prix being held in Montreal this weekend, Sunday June 10th. At The Passport Index, we can’t help but wonder, which passport (if any) will get you a visa-free access to all circuits of the tournament. According to our analysts, there are currently no such passports that allow visa-free entry into all 21 host nations. When it comes to the Formula 1 drivers themselves, some are fortunate enough to carry passports with visa-free access to most of the host countries, while others are faced with the hassle and extensive delays of being granted a temporary visa. 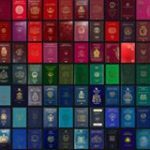 According to the above, we can deduct that most of the drivers hold European passports, allowing them visa-free entry into most but not all of the 21 nations that host the Formula 1. Out of the 20 drivers, the passport with the least visa waivers is Russia with a VFS of 113. This means, that when Sergey Sirotkin participates in the race, he can only enter 5 countries without the hassle of obtaining a visa, including visa-on-arrival for the UAE and Bahrain, an e-Visa for Mexico and visa-free for Azerbaijan and Brazil. For the 16 other countries however, a long and tedious experience awaits, which can be an administrative hassle to his team. The only global citizen of the bunch, Romain Grosjean, holds a dual citizenship of both France and Switzerland, increasing his Global Mobility score from Switzerland’s 160 VFS to +2 visa-free countries from his French passport. This gives him a Global Mobility Score of 162, the same ranking as the two German drivers, Sebastian Vettel and Nico Hulkenberg. These three drivers exemplify the importance of passport power and the impact it can have on our global commutes. Unlike Sirotkin- Grosjean, Vettel, and Hulkenberg will only have to obtain visas from Russia and China, along with an e-Visa from Azerbaijan. Although the drivers themselves don’t have to deal with the hassles of visa approval first hand, it’s a different story for many individuals across the globe limited to one passport. The benefits of global freedom extend beyond travel ease for many- representing safety, opportunity, and access to a better life. What do you think, are you Fast and Curious about increased Global Mobility? Find out how you can improve your Global Mobility Score by adding a second passport!